"This is definitely one of my favourite books as it is the first Sherlock Holmes story and I love the story of Dr. Watson and Holmes meeting for the first time. 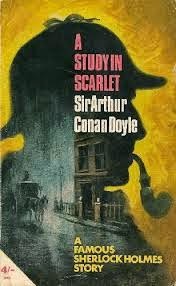 I think that Holmes is probably the best or at least one of the best detectives ever imagined (alongside Simenon's Maigret) and as usual in Doyle's stories the plot is really great. All in all it is an excellent book and I hope to have as much fun reading the other books as I had reading this one". "Do you like detective stories? If you do, you would love this book! The quality of the writing is excellent even though at times it's pretty tough to understand the language). Holmes and Watson are very well portrayed. This is one of Conan Doyle's classics. The reader is kept in suspense throughout most of this book, which makes you want to keep on reading".